Once my Colgate playing days ended in 2008, I decided that a good way to stay connected was to collect interesting pieces of Colgate Football history. That usually involved programs and ticket stubs, and eventually my ultimate goal became to get one ticket and one program from every year that Colgate has played football. Obviously, the early years are going to be tough, especially since it is very likely that there were no programs or tickets issued for those games, but so far I have programs from 110 of the 128 years and tickets from 105 of the 128 (there were no games played in 1918). You can see what years I need items from on the Wantlist page. If you have something I need or that you think I may want, email me at ColgateFootball@gmail.com. Other than that, feel free to use the links above to view all of the items I have been able to add to my collection. Thanks for visiting. I am a Colgate graduate from the Class of 2009. Both of my parents (Hi, Mom) graduated from Colgate in 1976, and my dad was an offensive tackle on the football team. My sister graduated from Colgate in 2006 and was a cheerleader during her time there. 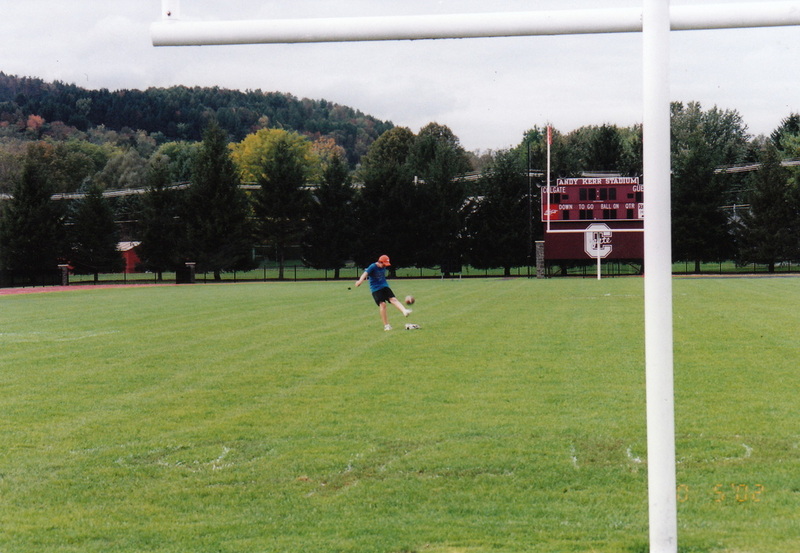 Naturally, I grew up a Colgate Football fan and was able to walk on to the team as a kicker for 3 of my 4 years. I traveled as the backup kicker for my senior season, 2008. I never got on the field but I do hold the record for most numbers worn (47, 48, and 63) and most lockers used in the locker room (5).